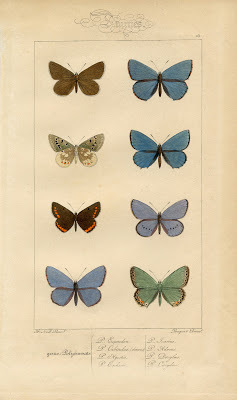 I adore these old Butterfly Prints, or perhaps they are Moths?! These are so colorful it’s hard to tell! This Vintage Printable came in the mail this week, straight from France! Included on the page are some lovely Winged Insects, colored in soft colors including Blue, Green, Periwinkle, Brown and a Creamy one too! There’s some wonderful typography on the page as well. This one dates to the mid 1800’s. I’ve included a High Resolution Printable, so that you can print this out, and frame it up right away, for some lovely Natural History Wall Decor! I received a few other items in this package as well, I can’t wait to share them with you guys!! Breathtaking! Love the script at the bottom. Thank you, Karen. Thanks so much Karen. These are just gorgeous. Thank you for the very beautiful things you share with us. My favorites are the winged insects and flowers. The pictures today are butterflies. You can tell by the antenna. Butterflies have very delicate ones while moths have a thicker one that looks kind of ‘furry’. Also the moths body is much thicker than a butterfly’s body. Love those butterflies! Thanks again Karen for your generous spirit! Hi, I am new here. Thank you for these butterflies. I`ll have something about them in my miniature -projects. Love all your work and I have tried some of it but your looks better. Enjoy all your work, and thank you for all your ideas.